So much rain had fallen in the high country, the Stuart Fork at the Trinity Alps Resort had risen a foot that morning. Heavy cumulus clouds and spotty rain, interspersed with a few brief patches of blue sky, accompanied us north on Highway 3, up Scott Mountain into a blanket of thick fog and low clouds, down through Callahan, and on to Etna for dinner at Barbara's favorite outback bistro, Bob's Ranchhouse. Rain persisted as we ate, so we decided to find a motel. We searched for Etna's alleged motel, following the confused gestures of two teenage girls as they crossed the street, but to no avail. Frustrated, we drove on to Fort Jones and bought gas. The cashier told us that the town's only motel, the Marble View, lay straight ahead on the left. Couldn't miss it. Passing through downtown Fort Jones, we noted a bed and breakfast in an old two-story Victorian. A sheriff's patrol car idled at an intersection just out of sight of the Marble View, which turned out to be seedy beyond comprehension. The motel's ringleader could not be found, and his drug-addled lieutenant was not at all sure which rooms might be available for overnight lodging. He showed us one with an unmade bed and someone's possessions strewn about the room, suggesting that we might just move everything aside for the night. A cash transaction would no doubt have suited him. Nervously we thanked him for his trouble and backed out to our van. We backtracked to the bed and breakfast and rapped on the front door. A mousy, middle-aged woman told us indignantly that they took only "pre-reservations." Fine. So we drove to Yreka, twenty minutes away. As we passed the Marble View Motel, we saw that the Sheriff's Deputy had swooped down on the occupants for any number of drug, morals, or human decency violations, and we considered ourselves lucky to have escaped the dragnet. In Yreka we found a vacancy at the Miner's Inn, while the drizzle outside turned to a persistent rain, and spent a very enjoyable first evening of our vacation, warm and dry. By Sunday morning the rain had ended and the parking lot steamed in the morning sun. We ate breakfast at Denny's and headed for the trailhead. From three maps and a telephone conversation with a Rangerette in Fort Jones, I had programmed road waypoints into the GPS. The complex network of logging roads was bumpy and completely unsigned. The Rangerette emphasized that we were to keep right at the fork below a house with a second-floor deck (which we never found), bear left thereafter and take all up-hill forks, but keep right at the big rock on the lower log landing, and not take the sharp turn at the top, but follow the road until it looped back in a hairpin return. The road became so steep in places that even in first gear I was afraid the van might stall, so I keep up a minimum speed a little too fast for the rocky, rutted jeep road. At last we emerged onto the ridge-top log landing at the Big Meadows trailhead. Three pickup trucks were the only vehicles in a parking lot that could have held more than thirty. The skies were mostly cloudy and ominous. The view of the valley and surrounding mountains was obscured by great swaths of brooding cumulus surrounding us, dark streaks of rain slanting below them. Spritzed occasionally by passing sprinkles, we packed hurriedly to get on the trail. The air was warm and muggy. 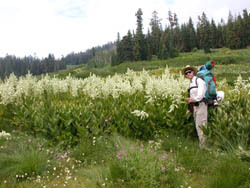 The hike began through the endless wet tall grass, shrubs, and flowers of Big Meadow. Our pantlegs and shoes were soaked even before we passed the wilderness boundary sign a quarter mile away. But it would get wetter. As we sweated in the jungle humidity, the trail occasionally squeezed through thickets of alder shrubs, fields of tall corn lilies and bear grass, aspen, delphinium, and other flora unknown, all with dripping leaves. Our sleeves got wet. Our shirts got wet. Out packs got wet. An ineffable Garden of Eden, Big Meadow possessed a silent, unsullied calm and beauty through which we passed unspeaking. I homed the GPS on Upper Wright Lake and watched for the distance to diminish. We hiked a few miles with our destination persistently off to the right a steady one-and-a half miles. After a while, however, we realized that the distance separating us from Upper Wright Lake had actually begun to increase. Out trail was not taking us there! Dismayed, we stopped for lunch, set down our packs against a great fallen log, and checked the map, only to discover that we were in Back Meadows on the Red Mountain Trail. 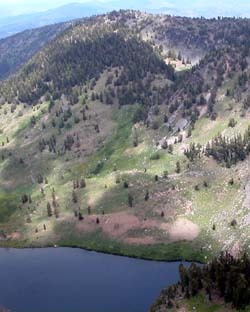 We had circled Upper Wright Lake in a great, level, clockwise loop, and were now about to descend the mountain slope southwest toward the Calf Lake turnoff, Log Lake, and Shakleford Creek. Somehow we had missed the Wright Lakes Trail junction long ago in Big Meadow, not far from the wilderness boundary. We donned our rain ponchos and considered our alternatives. One was to hike cross-country straight up a lush valley and talus slope toward a rocky outcropping a thousand feet above us, beneath which, the GPS told us, we would find Upper Wright Lake. We could see what might be traces of a path on the slopes above. But now the fog was coming in fast and low, and off-trail trekking would be ill advised in a total white-out. We decided instead to swallow our pride and wind back through those meadows we had just crossed, wading once again through marshy bogs and tall wet thickets of delphinium, corn lilies, and bear grass. Through an increasingly steady drizzle we had backtracked almost to the wilderness boundary sign when, uphill to the left and well off the trail, appeared the cairn we had missed on the way in. A paltry pile of small rocks had been stacked haphazardly on a low boulder lost in the lushness of the meadow. A four-by-four post lay in the deep grass nearby, stripped of its sign. The Wright Lakes Trail itself was an anemic, light tread almost impossible to trace uphill through the tall grass. As we looked for its course, we spotted a man and woman descending the trail toward us. We waited for them. They wore daypacks and informed us they had just bagged Boulder Peak. On a quest to climb the highest peak in each of California's counties, they intended to bag Whaleback and Goosenest next. Their score cards they did not show us, nor did we ask to see them, but that they had them we were certain. Again we pondered our alternatives. By then the weather had grown bad and promised to get worse. We decided we did not want to get caught setting up camp in the rain and spend the night in wet sleeping bags. So we returned to the trailhead, off-loaded our packs, snapped open the folding chairs, and built a blazing fire to dry our socks. The peak-baggers loaded their gear into two of the three trucks parked at the trailhead and drove away. 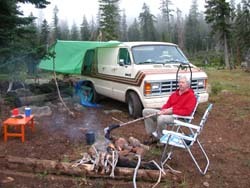 With our enormous green tarp trussed with sticks between the van and a red fir like a carnival sideshow, we spent our second night in the van. It rained hard off and on, and we read aloud to each other from the fifth Harry Potter book--The Order of the Phoenix--until it grew too dark to see. As night fell we could hear cowbells closing in nearby. Lightning flashed off to the south. We climbed into bed in the back of the van. Around 9 P.M. headlights flashed through the windshield. A vehicle drove in and a young man jumped out, climbed into the last remaining truck, and started the engine. Both vehicles drove off, leaving the log landing entirely to us. Monday morning dawned bright and sunny. At almost 6500 feet, our solitary log landing was an island in a sea of dense fog blanketing the Etna Valley thousands of feet below. Happy in the warm sunlight, we spread out our wet tarps, ponchos, pants, and sox to dry. Cows with clanging bells loitered bovinely in the grasslands on the periphery, eying us. Over coffee, tea, and oatmeal we debated whether to day-hike or venture a full backpack. 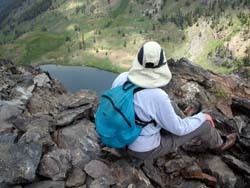 Despite a forecast of more rain, we boldly decided to backpack to Upper Wright Lake. Our backpacks were mostly still packed from the previous day's misadventure. Restuffing our sleeping bags and returning everything else to the van, we sweated in the muggy air. I put on my urethane-coated rain pants to avoid the soaking my clothes received the day before from the wet brush. This was a mistake. After the elusive junction, the Wright Lakes trail headed steeply uphill. The long wet meadow grass slowly gave way to sparser bunch grass, manzanita, aspen groves, and spindly chaparral with yellow flowers. After ten minutes in the tropical sunlight, my pant legs were as soaked as before, this time from my own perspiration. I stopped and doffed the rain pants. 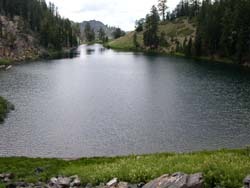 Via trail, the lake lay a little more than three miles away. The steep trail climbed up the open moraine over dry swells and down through moist meadows, until, approaching the ridge top, we finally entered cool patches of forest shade. Never quite attaining the crest, the trail headed generally northwesterly, then began to contour clockwise to the north, as it had done the day before through Back Meadows a thousand feet below. This time, the GPS informed us, we were less than a mile from our destination and the distance was laboriously closing. Stopping for a breather, we saw a man with two dogs a half mile behind us on the trail and expected that, like most others of more junior years, he would soon overtake us. 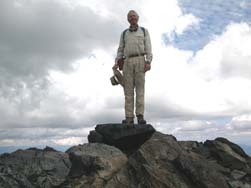 But by the time we finally crested the saddle at 7700 feet and gazed down the steep trail to the inviting green waters of Upper Wright Lake three hundred feet below, he and his dogs were nowhere to be seen. Odd. When we arrived at the lake, we chose a fine campsite down at the water's southeastern edge, instead of another nice one up the slope to the southwest beside a gurgling inlet stream. Ours proved to be an excellent choice. Serious thunderheads had sneaked up on us as we hiked, and rain suddenly seemed imminent. So, before eating lunch, we scrambled to set up the tent and stow our sleeping bags, pads, regalia, and paraphernalia inside. We had the lake to ourselves, or so we believed. As we ate lunch the young man we had seen on the trail finally arrived with another fellow and the two dogs. They moved into the site we had passed over, up the slope on the south side of the lake. We soon discovered that two more young men with two more dogs were camped under a large tarp on the west end of the lake by the outlet. After lunch we day-hiked past the outlet campsite and discovered an overlook above Lower Wright Lake, marveling at the spectacular drop from Boulder Peak down to the water. No rain! We strung up our hammocks and relaxed. That evening, we had difficulty finding sticks and branches dry enough to kindle a fire. After much hand wringing and blowing on feeble coals, we finally managed a blaze hearty enough to dry out and burn the damp sticks. At dusk, the fellows camped at the outlet went for a swim, hooting and hollering in the cold water, then built a huge bonfire to dry off. Overhead the skies grew clear and a million stars twinkled down. On Tuesday morning we awoke to surprisingly blue skies, except for a strange cloud bank far to the west, and over coffee and tea admired the lake, its setting, and our fortunate choice of campsites. 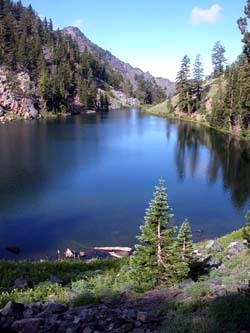 Upper Wright Lake sits in an intimate glacial cirque at 7400 feet, the highest lake in the Marble Mountains Wilderness. Our campsite at shoreline consisted of several narrow, almost-level steps cut into the steep south slope. The forest was predominantly Mountain Hemlock, with a few red firs and whitebark pines. A seep just below the surface kept the ground moist, supporting a lush broad-leaf ground cover typical of the wetter western Marble Mountains. Just above the water's edge moss grew at the north base of the closest hemlocks, and short willows thrived in thickets as shrubs. Across the lake the south-facing slope presented an altogether different micro-climate. There in the sun-baked soil grew a forest of red fir, crowned with lemonade yellow-green cones, and a sprinkling of foxtail pines. Open areas were covered with manzanita and little red-fir Christmas trees. The north and south sides of the cirque are a kaleidoscope of glacial till, red peridotite and green serpentinite, dazzling white granite, sparkling quartz, jet black schist, and a jumble of red and yellow metamorphic rocks. Up the talus and bolder slope to the east loomed the rocky face of the glacier-carved head wall on which giant, gnarled whitebark pines grew to the crest. Clark's nutcrackers scolded us endlessly from their nurturing arms. Mountain mahoganies crowned the head wall crest. To the west our little hanging valley dropped away into the vast north-facing glacial valley of Lower Wright Lake. The intimate bowl in which we were camped had its drawbacks. First, all the firewood within a quarter mile of our camp had been collected and burned. We were forced to climb the slope across the lake to forage for wood in the red fir forest above. Second, there was nowhere to hide when nature called. All places in the bowl were in view of all other places. Again, personal hygiene required a long walk and biblical patience. In search of firewood we climbed the sunny ridge north of the lake and from its crest saw Marble Mountain northwest of Lower Wright Lake. On the way back to camp we collected lots of dry wood, broke it up, and stacked it under our bench, over which we had strung a protecting green tarp. Meanwhile the weather front had moved in from the west, threatening rain for the fourth day in a row. We decided to take our rain gear and hike to Lower Wright Lake for lunch. We descended the trail from our lake's outlet stream into the vast glacial valley of Lower Wright Lake. Although forested above, the broad lower valley was barren except for a few trees standing singly or in small clusters. At first the trail switched-back past foxtail and whitebark pines, red fir, and small groves of aspen and stunted willows. Mountain mahogany, sage brush, and manzanita adorned the moraine's drier hummocks. Then it zigzagged down through an unbelievable display of wildflowers in the broad stream-fed wet meadow between the two lakes. Large patches of Delphinium stood side by side with Monkshood, allowing us to compare the two blue flowers. Also in profusion were yellow monkey flowers and buttercups, red tiger lilies and paintbrush, white cow parsnip, bear grass, and corn lilies, and beautiful blue gentian. Many other flowers we could not identify. Near the bottom we encountered a trail sign nailed to a tree, one arrow pointing up the trail to Upper Wright Lake, and the other pointing down to Lower Wright Lake. Inexplicably the sign faced north, with no evidence of an incoming trail. Puzzled, we concluded it was just another part of the misinformation campaign we had endured since first heading up the road to Big Meadow. We hiked off-trail south down to the barren east shore, the turned back north toward the outlet stream. Two exposed campsites sat on the open north end of the lake under giant foxtail pines. We ate lunch with a spectacular view of Boulder Peak, its sheer cliff still sheltering a few small pockets of snow. The landscape seemed to change colors as the clouds moved in and out. An osprey, with its shrill, haunting cry, fished. After lunch we intended to cross the outlet stream to check on a few potential campsites in the moraine above, but I, leaping, slipped on a wet rock and fell on my backside in the water. For a long moment I just sat there stunned with my legs bent oddly beneath a submerged rock, water to mid-calf, while Barbara feared a displaced hip or worse. The stream gurgled serenely by, filling my boots, as I appraised the damage. No broken bones, no displaced joints, no sprains, no strains, not even a scrape or a bruise. Slowly I struggled to an upright position, feet and legs drenched. Luckily unhurt except for my dignity, I sloshed back to the nearby campsite and, sitting on a low red rock, somberly poured water from my boots and wrung out my socks. As we started up the steep trail back to the upper lake, we realized there were many cow paths through the meadow leading down to the boulder creek trail. The true trail was intended to follow the crest of the lateral moraine on the east side of the valley, joining our trail where we had encountered the sign facing north. Sure enough, a light tread traced the moraine down the slope from the sign. Few wayfarers followed it, preferring to cut across the wet meadow directly to the lake. Pausing to identify flowers at the stream crossing in the lush meadow between the lakes, we encountered a man and his son hiking down. The man was stout, puffing, and sweating profusely beneath an enormous black backpack. He seemed relieved to stop for a few minutes and tell us his story. Years ago as a boy he had been to Lower Wright Lake with his father and was now determined to visit the same misadventure on his own skinny, silent son. Starting from the Big Meadow trailhead at nine that morning, they had likewise missed the trail junction in the meadow. Like us, they had hiked down the Red Mountain Trail. Almost to the Calf Lake turnoff, the man recognized Boulder Peak over his shoulder and realized their blunder. It was nearly midday when they began the long, steep, cross-country trek up through Back Meadows towards Boulder Peak, eventually crossing the ridge trail and dropping down through our lake. The father appeared too exhausted to lift his arms, nearly toppling over as he finally turned to continue down the trail. The unspeaking boy shrugged a "whatever" and somberly followed his destiny. At camp we indulged in a luscious nap in the tent, until we heard our pots being banged about. The ground squirrels, no doubt. The weather turned cloudy and cold. After a warm dinner we ambled slowly up to the ridge crest, past white penstemon with pinkish-purple edges and through typical Marble Mountain understory. The sparsely forested crest provided us with spectacular views of Mt. Shasta, the Russians and Trinities, and clear skies to the east. We saw a kestrel and heard cowbells clanging far below us. That evening a nice fire kept us warm, but in our sleeping bags that night our feet were cold. At three in the morning we emerged briefly from the tent into a thick bank of fog. Wednesday morning we slept late and woke to blue skies and cold. The temperatures had dropped to around 40 degrees. Our up-slope neighbors were shouting irritatingly, and we soon surmised that the dogs had run off that morning. One young man went hollering off into the wilderness after them, while the other went fishing. It was not hard to tell whose dogs they were. Planning our expedition to the Wright Lakes, we had envisioned pushing on to Deep Lake for a night or two, but the weather failed to cooperate. Little attention had been given to Boulder Peak. That the dedicated Peak Baggers we met the first day had found Boulder Peak a righteous destination unto itself had caught us by surprise. But seeing its rocky north face rise abruptly 1400 feet above Lower Wright Lake, sliced open like a monumental wedding cake, had certainly gotten our attention. As we perused the literature about Boulder Peak, two things struck us. First, the Back Meadows Tail appeared to rise within a few hundred feet of the peak before it crested the saddle and dropped into pristine Second Valley. Second, at 8299 feet Boulder Peak lacked only a single foot to be 8300 feet. I thought I could help. The wind gusted as we began our hike to Boulder Peak. On our way up from camp we encountered our neighbors' dogs returning from their forbidden foray. No one was around to whom we could announce their return. After sniffing us thoroughly, they headed back to camp on their own. At the ridge above our lake, we scraped our heads on the billowy clouds that had risen to expose the Scott Valley below. We stopped to admire the view. 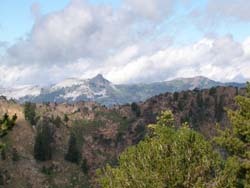 The Back Meadows Trail followed the ridge south of the crest, rising at times to a saddle to allow a tantalizing glimpse down at the Lower Wright Lake valley. Amid rough outcroppings of bedrock and grassy meadows stood lovely isolated stands of white bark pine, fox tail pine, red fir, and mountain mahogany. Near the final saddle, we climbed off-trail over huge boulders the last few hundred feet to the peak. The views were spectacular. Directly below us lay the steel-gray waters of Lower Wright Lake. Dark clouds threatened to the south. In a hanging valley chiseled into the east wall of the great U-shaped valley we could just see the dark rim of Upper Wright Lake beneath a patch of sunlight. To the east Mount Shasta loomed amid mostly blue skies. Everywhere else, rain clouds seemed to be closing in. 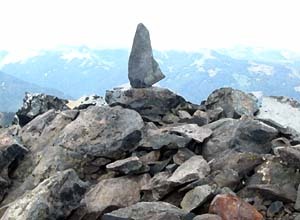 After a hurried lunch, I wrestled a heavy jagged rock to the summit, erecting a monument to increase the peak's elevation to a round 8300 fee while Barbara, a few feet lower, nervously eyed the clouds for that terminal bolt of lightning. We were reluctant to leave, but preferred not to experience a lightning storm at the peak. On the way back down the ridge we spotted a pair of brilliant blue Mountain Bluebirds. The rain held off as we meandered back to camp, built a fire, and stowed our gear. As we relaxed before the roaring blaze beneath our green tarp strung from the trunks of sheltering mountain hemlocks, the first thunderstorm hit. In our rain gear under our tarp we watched the rain swirl at us from all directions. Squalls moved rapidly across the lake and sprayed us with slanting blasts of rain, but we stayed warm and relatively dry. It was pretty exciting and a whole lot better than riding out the storm blindly in our wind-buffeted tent. Between squalls we cooked dinner, ate, and washed the pot and bowls. Then we hunkered down to watch a hailstorm, and then another thunderstorm roar through our camp with crackling thunder exploding directly overhead. The temperature dropped and the wind picked up, but soon the storm passed and the skies began to clear. We dried our rain gear in shafts of late afternoon sunlight. That night we slept warm and cozy. Thursday dawned windy and cold. We ate breakfast and listening to the tooting of a nuthatch, packed up leisurely, and were on the trail before noon as the sunshine began to warm things up. All along the ridge trail magnificent vistas opened up of the Scott Valley, Cascades, Siskiyous, Russians, and Trinity Alps, views which had been obscured by fog and low clouds on our way in. At the trail junction in Big Meadow, someone had heaved the sign post, still lacking a sign, back upright, propping it up feebly with a few rocks. The work oozed impermanence. At the trailhead I heaved off my pack and assumed the heaviness of an even greater, if abstract, burden. I dug out the cell phone. There was reception, so I resignedly punched in the number of the office to confirm that I was still expected to attend a meeting as corporate counsel the next morning. The meeting had been canceled! Oh, lightness of being! The road down from Big Meadow seemed even more circuitous than when we drove in. Nothing looked familiar. At every crossroad we followed a single set of fresh tire tracks, hoping they were left by the ranger who had resurrected the signpost in the meadow, and always chose the downhill road. Even so, after one major fork, the downhill route seemed just too incredibly steep to be the same road we had driven in on. We weren't even sure the van was geared low enough to drive back up the road if it proved to be wrong. We stopped, looked around, wrung our hands a bit, and finally got out the GPS to verify that we were heading toward the next road junction I had entered from the map. We were, but the tedious decent took an hour.